Please read the following carefully. Failure to follow these guidelines and instructions could result in your financial loss, regardless of claim. This is delivery by other than UPS & USPS. 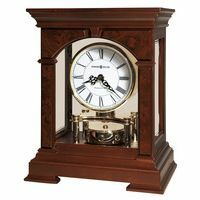 This type of delivery will be made for the order of a Grandfather clock and some large and heavy wall clocks. If your clock is damaged in shipment and delivered by freight company (NOT UPS or FedEx or USPS), YOU MUST NOTE THE DAMAGE ON THE FREIGHT BILL FOR A CLAIM TO BE VALID. FAILURE TO NOTE THE DAMAGE ON THE DELIVERY FREIGHT BILL, WITH SIGNATURE OF DRIVER DELIVERING PRODUCT, WILL VOID YOUR ABILITY TO SEEK REIMBURSEMENT FOR DAMAGES. IF THE DAMAGE IS NOTICED WHILE DELIVERY IS BEING MADE, IT IS IN YOUR BEST INTEREST TO REFUSE THE SHIPMENT AND NOTIFY US IMMEDIATELY. A REPLACEMET WILL BE SENT AND WE WILL HANDLE THE CLAIMS PROCESS. Please remember: IF YOU ACCEPT THE DELIVERY OF A DAMAGED CLOCK, DELIVERED BY A FREIGHT COMPANY (trucks carrying very large objects, e.g. 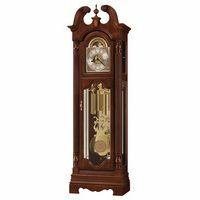 grandfather clocks, curio cabinets), AND YOU DO NOT REFUSE THE CLOCK, AND YOU DO NOT NOTE ANY DAMAGE ON THE FREIGHT BILL, WE WILL NOT BE ABLE TO ASSIST YOU WITH YOUR CLAIM. YOU WILL HAVE TO PROCESS THE CLAIM YOURSELF. Call 1-800-4CLOCKS (425-6257), or you can send faxes to us at 1-212-202-6140, or email us at Sales@1-800-4CLOCKS.com and describe the nature of the damage along with the clock style, name, stock number, manufacturer's name, your order number, name, address and the phone number where we can reach you. Clocks will be delivered in the original factory carton, with easy set-up instructions. Shipping time is 1 to 3 weeks if the clock is in stock with the manufacturer. You will be notified if shipment will be delayed by email, fax, or phone. We will do everything possible to get your order to you as quickly as possible. Any clock shipping UPS or FedEx or USPS will be allowed to be returned within forty-five (45) days of delivery for a credit of the original charge, less the 2 way shipping charge plus a $10.00 restocking fee. NO CLOCK SHIPPED COMMON CARRIER will be allowed to be returned under any circumstances, with the exception of refusal of delivery for the express cause of damage at the time of delivery. If you are returning a clock, please contact us by calling 1-800-4CLOCKS (425-6257) or send an email to us at Sales@1-800-4CLOCKS.com and describe the nature of the damage along with the clock style and make, your order number, name, address and phone number that we an reach you for instructions on your return. You may send faxes to us at 1-212-202-6140 as well. Please do not return the clock without contacting us for instructions so that we can be sure that you are credited properly for the return. We will then contact you with information about your return, credits due and/or a replacement. IF YOU HAVE ANY QUESTIONS REGARDING OUR SALES AND RETURN POLICY. PLEASE E-MAIL THem TO US at: Sales@1-800-4CLOCKS.com. 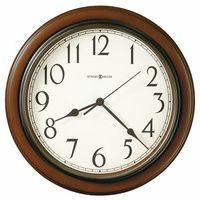 By using this website, www.1-800-4CLOCKS.com, you agree to be bound by the terms outlined above, regarding shipping and return. 1-800-4CLOCKS reserves the right to change or update information and/or prices at any time. Although we work very hard to avoid errors in any information or pricing, we reserve the right to correct errors and cannot honor pricing errors in our product listings. Howard Miller warranty for grandfather clocks (floor clocks) is 2 years. Howard Miller warranty for wall and mantel clocks is 1 year. Specific warranty information and exceptions are described with the instruction manuals packed with each clock. In order for the warranty to be valid, the clock must be unpacked, set-up or hung and operated properly, according to those very detailed instructions. Howard Miller warrants to the original consumer/purchaser or recipient that this product will be free from defects in material and workmanship under normal use and service for a period of two years (for Grandfather Clocks) and one year (for wall, mantel and other clocks) from date of purchase. Howard Miller's obligation under this warranty shall be limited to repairing the product with new or renewed components or, at its option, replacing it with a new or renewed product. This warranty does not include damage to product or components resulting from abuse, accident, alteration, climatic/ environmental conditions, damage beyond normal use, freight damage, mishandling, misuse, or unauthorized repair. HOWARD MILLER DISCLAIMS ANY LIABILITY FOR INCIDENTAL OR CONSEQUENTIAL DAMAGES ARISING OUT OF BREACH OF THIS WARRANTY OR ANY IMPLIED WARRANTY. IMPLIED WARRANTIES ON THIS PRODUCT SHALL BE IN EFFECT FOR THE DURATION OF THE EXPRESS WARRANTY SET FORTH ABOVE AND THEREAFTER, THERE SHALL BE NO WARRANTIES, EXPRESS OR IMPLIED, (INCLUDING MERCHANTABILITY OR FITNESS FOR ANY PARTICULAR PURPOSE), ON THIS PRODUCT. Hermle Black Forest Clocks warrant their clocks for two years from the date of sale. A copy of your purchase receipt must be used to show date of purchase. Clocks must be returned to Hermle Black Forest Clocks in Virginia for warranty service. If your new clock (purchased from 1-800-4CLOCKS) is not operating properly, E-mail us or phone us a 1-800-4CLOCKS (425-6257) and tell us the problem, and we may be able to help you adjust your clock. If you cannot get the clock working, you may send it to Hermle Black Forest Clocks in Virginia for warranty service. The clock must be sent properly packed in its original packing. Hermle makes the following limited warranties. These limited warranties extend to the original consumer purchaser or any person receiving this product as a gift from the original consumer purchaser and to no other purchaser or transferee (the "Consumer"). Hermle warrants to the consumer that this product will be free of defect in material and workmanship for a period of two years from the date of the original retail purchase. The obligation of Hermle under this limited warranty is limited to repair or replacement (at Hermle's option) of this product. A return authorization number is required from Hermle prior to the return of any product to Hermle. Please call (434) 946-7751 for a return authorization number. Clocks returned must be returned within the original carton to eliminate damage during the return transportation. Colibri (parent company of Seth Thomas and Movado Clocks) warrants to the original purchaser that it will repair or replace (at Colibri's option) the Seth Thomas clock due to any manufacturing defect for one (1) year from the date of purchase. Colibri requires proof of original ownership as proof or warranty coverage, and Colibri must receive any claim under this Limited Warranty within one (1) year of purchase. Colibri SHALL NOT BE LIABLE FOR ANY INCIDENTAL, INDIRECT OR CONSEQUENTIAL DAMAGES, WHETHER ARISING IN CONTRACT OR TORT. Chelsea manufacturing warranties vary by product, and are generally in the 2-5 year time frame, depending upon the individual product ordered. Please see each description, and inquire when information is not available.